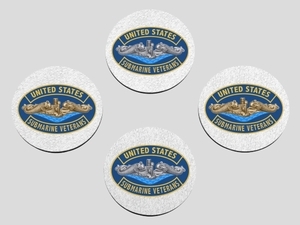 The USSVI insignia coaster set is not the typical scan of a patch. We have taken the original graphic and completely re-drawn the insignia from scratch. Careful attention has been taken to accurately create this new exclusive artwork in brilliant color at the highest quality possible. We create each coaster set to order in Cumberland, Maryland using the latest state of the art printing methods. Unlike most coasters available, the ink is extremely bright, color accurate and stable.